Number of large potholes on Corporate Parkway west of Boyer. Thank you for reporting this issue to the Village of Algonquin using SeeClickFix. Our staff will now begin its investigation of your issue. Your service request ID is #12143. Thank you for reporting this issue to the Village of Algonquin using SeeClickFix. Our staff will now begin its investigation of your issue. Your service request ID is #12141. Thank you for reporting this issue to the Village of Algonquin using SeeClickFix. Our staff will now begin its investigation of your issue. Your service request ID is #12086. The Village of Algonquin has resolved this issue. Since your patching on North River Road how about making a swale at the intersection of Starr Dive and River so that the water and gravel that always comes down every time it rains go's directly across rather than flooding the rest of the neighborhood? Thank you for reporting this issue to the Village of Algonquin using SeeClickFix. Our staff will now begin its investigation of your issue. Your service request ID is #12135. 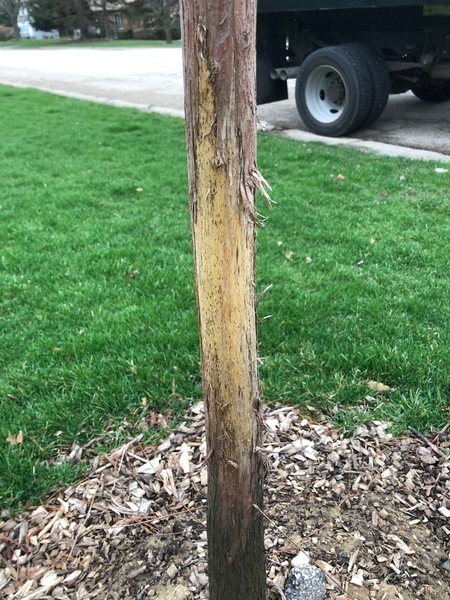 Tree planted last spring on parkway sustained severe damage on its bark due to a deer rubbing his antlers to remove the velvet from said antlers. More than 50% of the bark has been removed from the tree's circumference and about 30 inches in height there is no bark left. If i would have known this I would have protected the trees trunk. Please advise and please place me back on the list for a parkway tree. Thank you for reporting this issue to the Village of Algonquin using SeeClickFix. Our staff will now begin its investigation of your issue. Your service request ID is #12128. The damage is about 30" in lenght not height. Tree will be removed and you are back on the list. Thanks for letting us know of this issue and you have a Great Day! This evening (4/17/19), my husband and I wanted to walk our two dogs at Presidential Park on Highland. We walked to the park from our residence. We noticed a total of four unleashed dogs at the park. We hesitantly began to walk the path knowing there were unleashed dogs in the park. Shortly after, two dogs left their owners and began running towards our two dogs. The owners were calling their dogs and they would not return to them. The two dogs approached our two dogs, so we left immediately. We told the owners to leash their dogs as we were leaving. We are asking for Algonquin to please reinforce the leasing of dogs so we can walk our dogs at the park. Thank you for reporting this issue to the Village of Algonquin using SeeClickFix. Our staff will now begin its investigation of your issue. Your service request ID is #12127. The comment/request has been forwarded to the Algonquin Police. Please contact them with future concerns at 857-658-4531. Thank you. Thank you for reporting this issue to the Village of Algonquin using SeeClickFix. Our staff will now begin its investigation of your issue. Your service request ID is #12116. The village sent two workers out to the site this morning to remove the rubble. That was really fast service! Thanks, Algonquin Public Works! Your request has been received. This will be scheduled for repair. Thank you for reporting this issue to the Village of Algonquin using SeeClickFix. Our staff will now begin its investigation of your issue. Your service request ID is #12096. At Spella Park playground, the street light at the playground has been cycling off and on for a few weeks. This light is the antique 20'pole light with glass shaped like an acorn. Looks like it has a hps lamp with ballast that the thermal overload keeps over heating and turning off the lamp, then after it cools off it turns back on again. This happens every five minutes. Sooner or later something will burn up. The lamp is the one right in front by the slide/swings utility box with contactors timers. Thank you for reporting this issue to the Village of Algonquin using SeeClickFix. Our staff will now begin its investigation of your issue. Your service request ID is #12064. Message through Chamber website indicates crosswalk lights are not working on Edgewood between Harper and Route 31 (which is the Cardinal Drive pedestrian walk). Thank you for reporting this issue to the Village of Algonquin using SeeClickFix. Our staff will now begin its investigation of your issue. Your service request ID is #12113.